We’ve all left a water bottle in the freezer overnight only to find it bulging the next morning. That’s what water does when it freezes. It expands, right? Did you know, it is possible to freeze water without it expanding? The ice that results from these two freezing methods is referred to as vitreous, meaning glass-like. Recent technological advances in cryo-EM have led to unprecedented resolution of unfixed and unstained macromolecules and macromolecular complexes, providing insight into the details of cellular and molecular structure that have never before been possible. For example, amino acid side chains, important among other reasons for the role they play in complex molecular functions, can now be visualized. The next hurdle is making cryo-EM work with thicker specimens. Because the optimum thickness of a sample is only 100 - 200 nm, it is not possible to image macromolecules in their native cellular environment. In fact, only the margins of cultured cells can be examined because the intact cell is just too thick. In the 1940s Wadsworth Center was the first public health laboratory with an electron microscope, and since then it has continuously upgraded its capabilities. Much of the equipment is one-of-a-kind, some of it custom-designed and/or modified by the 3D-EM Facility Manager Mike Marko. For example, one instrument is currently being modified to run unattended, gathering data over nights and weekends. 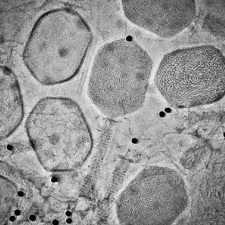 Dr. Rajendra K. Agrawal is currently using cryo-EM to look at ribosomes, the molecular complexes that synthesize proteins in all cells and the target of many antibiotics, to understand the interactions and changes in shape that take place during translation at the level of 3-5 Ångstroms (an Ångstrom is one ten billionth of a meter). In fact, the Agrawal laboratory was the first to successfully capture a cryo-EM image of the mammalian mitochondrial ribosome, the chloroplast ribosome, and a protistan mitochondrial ribosome. Michael Marko is pursuing two projects that will broaden the applicability of advanced cryo-EM in biology. The first utilizes a focused ion beam to slice vitreously frozen specimens thin enough for EM, without the artifacts introduced by traditional (mechanical) methods. Rather than melting the frozen specimen, the ion beam vaporizes a thin layer of the specimen as it cuts. First developed by the Marko laboratory, this highly complex method is used in only a handful of facilities worldwide. It enables high-resolution imaging of macromolecules within their cellular environment. With refinement, this tool will be available to more researchers. The second aims to improve phase-contrast imaging. Heavy atoms, used as EM “stains”, deflect electrons outside the imaging range creating a shadow on a bright field. The biological samples themselves are comprised of light atoms that don’t deflect electrons to this extent. However, the interaction between the electron and the biological sample is enough to delay the arrival of the electron at the detector. This is referred to as a phase shift. The phase difference can be “amplified” by operating the EM in a “phase contrast” mode, enabling direct imaging of the biological material and avoiding the need for stains. Because the images are still weak, Marko is developing “phase plates” (the first in the US to do so), as a way to improve contrast. Dr. Haixin Sui has developed methods which provided the first-ever electron micrographs and tomograms of vitreously frozen primary cilia of kidney cells. These methods can in turn be utilized to characterize structural abnormalities of this vital organelle in cells from biopsy specimens of patients with cystic diseases. In the future, it may contribute to in vitro drug screening and therapy development. In addition, his team has streamlined a method designed to use cryo-focused ion beam EM for routine specimen preparation of vitreously frozen cells on EM grids. This allows them to investigate structural regulation of epithelial cells in response to extracellular environmental changes and infections. Some of his research results have been included in several college cell biology textbooks.